Arctic Spas® brand hot tubs are designed for use in the world’s harshest climates and are engineered for efficient performance, even in extreme Northern locations. No what where you call home, this attention, to engineering and design, provides your guarantee of reliability, economy and peace of mind. No climate on Earth is too extreme, cold or warm, for an Arctic Spa. The Arctic Spas® brand of portable hot tub was developed in northern Canada. Here the extremes of climate and weather transformed the Arctic Spas® brand into the most energy efficient, longest lasting, and easiest to maintain, line of hot tubs, in the world. Arctic Spas® Swim-Spas, also described as All Weather Pools, are designed engineered to the same extreme standards that have made Arctic Spas® hot tubs renowned the world over. With their engineered reliability, quality and extreme energy efficiency, Arctic Spas Swim-Spas deliver the benefits of a swimming pool, hot tub, and exercise pool all in one extremely high quality, compact and portable unit. For a small fraction of the cost of full size swimming pools, you get everything you need, for aquatic fun and fitness. Here is the number one reason to choose an Arctic Spas® brand Swim-Spa: They cost less to operate. They are designed for extreme cold climates which means the insulation design has to be efficient in freezing sub zero temperatures. If you live in a place with cold winters it is the only logical choice. Depending upon the location, typical outdoor temperatures can fluctuate from a wintertime-22ºF(-30ºC) to +95ºF (+35ºC) in the summer. A quality outdoor hot tub has to be built with extremely intelligent designs and only the very best components and materials. The underside of every model is an engineered, elevated, insulated base, that allows the units to be installed on any level, suitable substrate and not just on a concrete pad. People, the world over, value and appreciate the benefits of this design philosophy. No matter where you are located or what type of climate and temperature ranges you have, lower operating costs and less maintenance always make sense. 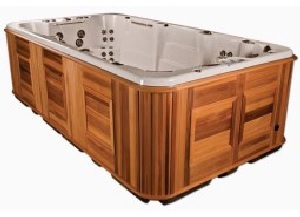 ● Selection of Hot Tub models, sizes, colors and features to suit every need. ● Better insulation and thermal cover design reduces heat loss. ● Rugged design provides greater reliability and ease of maintenance. Arctic Spas® brand hot tubs are world famous for their unique designs, which provides lower running costs, less maintenance, and rugged beauty. Arctic Spas might cost a bit more, than other brands, but they tend to last much longer and have reduced operating costs. Over the years of service and enjoyment, this will more than compensate for the higher initial investment. 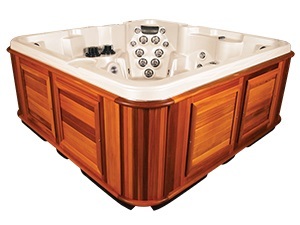 Coyote Spas® brand hot tubs have a similar core design and are as energy efficient and low maintenance, as the Arctic Spa brand. Coyote Spas® are made with fewer choices of size, color, and high tech options. This makes them less expensive to manufacture, without sacrificing quality, and more affordable to purchase. ● Selection of Swim-Spa models, sizes, colors and features to suit every need. Arctic Spas® brand Swim-Spas allow you to swim all year, use a hot tub all year, enjoy family aquatic fun all year long and save purchase and operating costs, compared to buying and maintaining a traditional swimming pool. In addition, installation is easy, with no digging, no contractors, no special equipment. Simply, crane into place and its ready to fill with water. Like all Arctic Spas, it is extremely efficient to operate, with minimal impact on your electrical bill, typically costing less than $2.00 daily, depending on local electrical rates. The core design is virtually identical to our world famous hot tubs, delivering extreme energy efficiency, low maintenance, and advanced control technology. 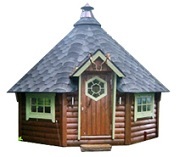 Some other Arctic Spas® products to enhance outdoor living.